Afrojack’s long-awaited official remix to Keane’s ‘Sovereign Light Café’ will now be released on December 24 exclusively on Afrojack’s own Wall Recordings. A mainstay in his sets across the world over the past few weeks, the track has quickly gained popularity within various sections of the electronic community. Combining the anthemic vocals of Keane front man Tom Chaplin with Nick van de Wall’s production techniques, this remix is a good way to round off what has been by far the biggest year yet of Afrojack’s career. Having headlined many festivals this year as well as dropping releases such as ‘Can’t Stop Me’, ‘Annie’s Theme’ and ‘Rock The House’; Afrojack seems to be going from strength to strength. Kicking off 2013, Afrojack will host a massive sold-out New Year’s Eve event at New York’s Pier 94 with his Jacked family and another recently added show with Diplo on December 30 too! 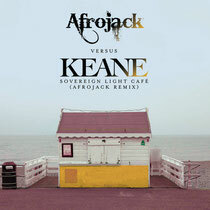 In addition to the remix for Keane, Afrojack will soon release another official remix – ‘Gangnam Style’ by Psy. He is currently working on his debut artist album, set for release in 2013, and his collaboration with Chris Brown on the track, ‘As Your Friend’, will be the first single to be released off the album.